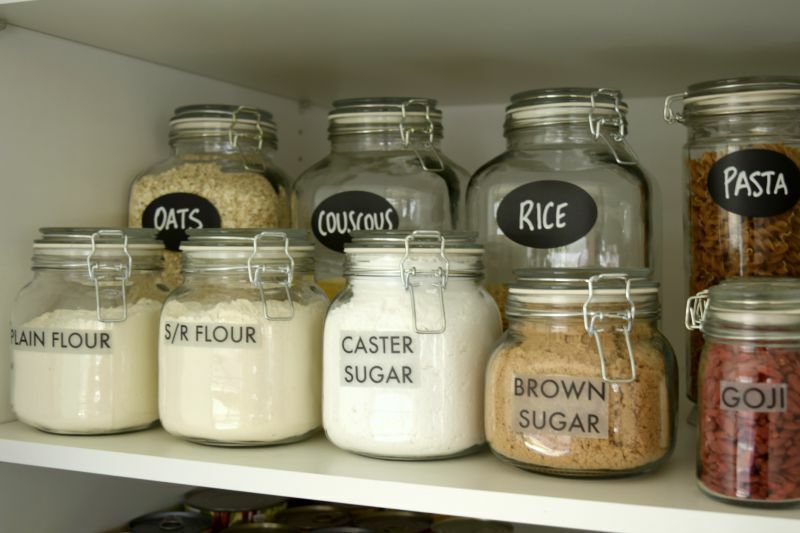 When did you last declutter your pantry? 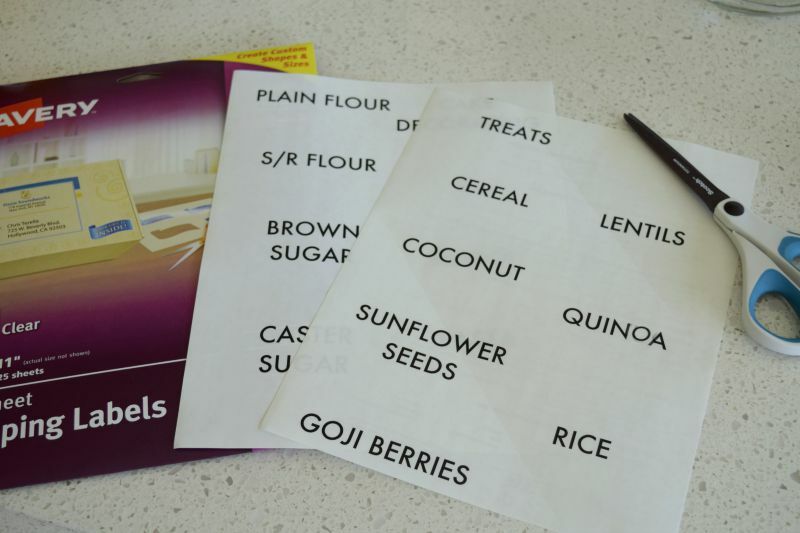 If like me your pantry has gotten a bit out of hand and you’re finding it hard to squeeze your shopping in, it might be time for a pantry declutter. The thought of cleaning out your pantry may be as appealing as watching grass grow but it doesn’t take that long and the results are surprisingly satisfying. To organise my pantry, I’m using jars and accessories from The Reject Shop and will be doing a few mini DIYs or hacks to adapt some pieces so they tie into my black and white colour scheme. Note: you can find all of these items at The Reject Shop except for those marked with an asterisk which I purchased from my local stationery store. 1. 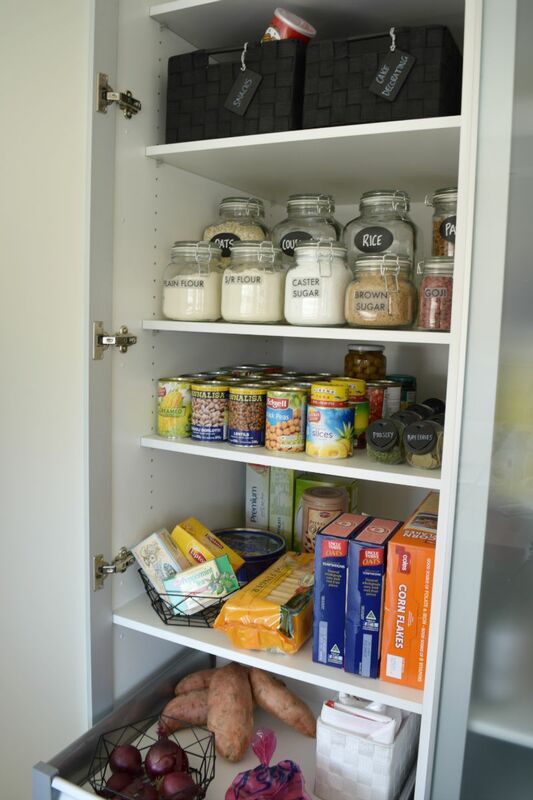 Completely clear out your pantry – that’s right, every last thing needs to come out of your pantry so you can give the shelves a good wipe down and take stock of all the items you need to organise. Anything past its expiry date or that you know you’ll never use again (like a spice you hated) should go immediately in the bin and all other items should be grouped into categories i.e. all cans grouped together. 2. Keep packaged foods fresh by putting them in clip top jars. These jars are ideal for foods like flour, sugar, grains, pasta and just about anything you can fit into them. We’ve even seen people use them to store treats (I don’t have the willpower for that! ), tea and beans. I used two different types of labels on these jars. 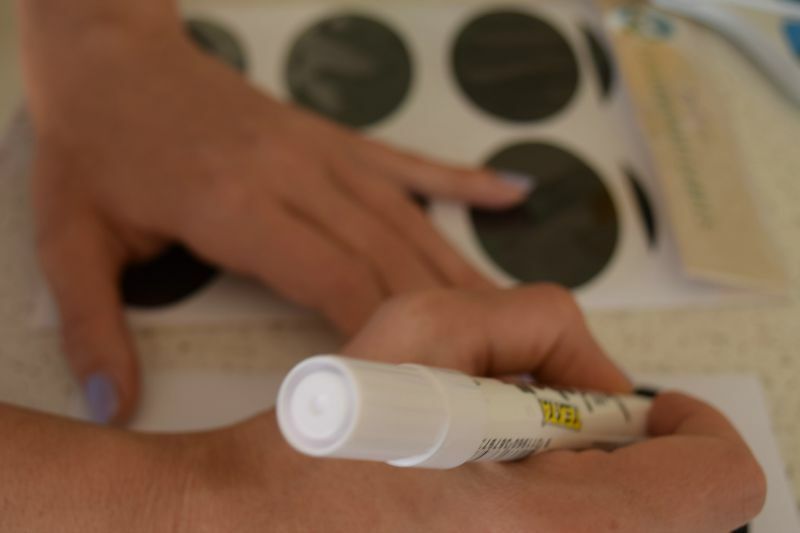 On the larger jars I used handy chalkboard labels from The Reject Shop (they also have more decorative versions available) and wrote on them using a white chalkboard texta. On the smaller jars, I printed the name of the contents onto clear labels. 3. If you like to bake, you may find that all these items take up a lot of space in your pantry and can look messy. 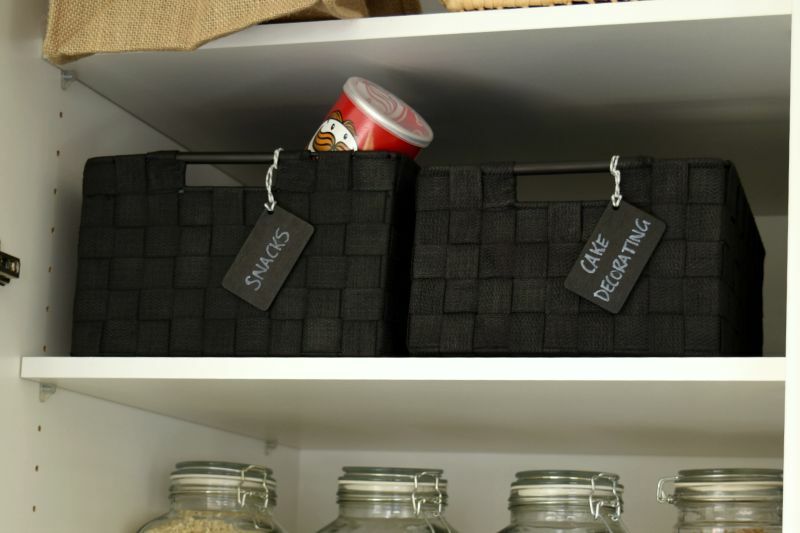 An easy way to keep them organised while maximising space in your pantry is to place them into a basket and remind yourself what’s in there using a swing tag! 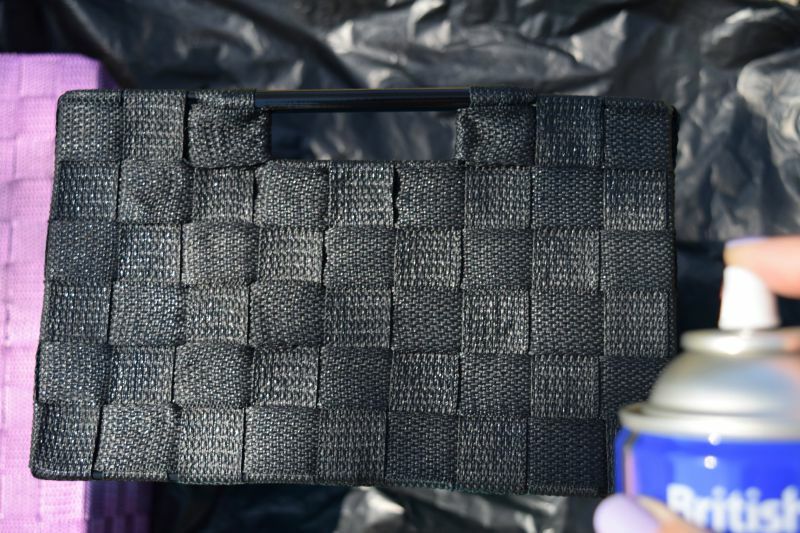 I spray painted two of these new angel baskets in matte black and love how they turned out! 4. Now I don’t know about you but I’m hopeless at remembering to bring my own bags to the store! 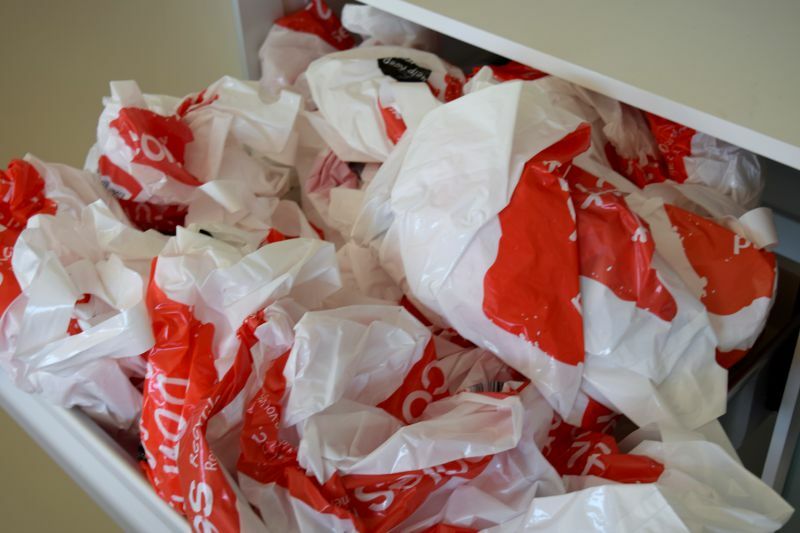 This means I have reusable plastic bags bursting out of my pantry. Using a clever folding trick, I turned these bulky plastic bags into neat little triangles and stored them in a small angel basket (check out the video I made below to see how easy it is to fold your plastic bags). This freed up space for other things in the drawer like potatoes and onions which I’ve placed in a geometric basket spray painted black. 5. I placed all my spices and herbs into these stylish pinch jars which will help keep them fresh and look pretty. 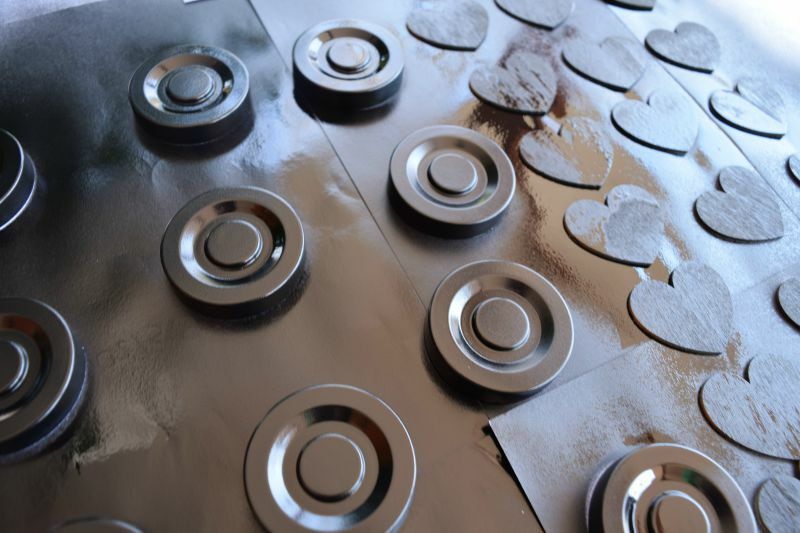 To fit in with my colour scheme, I spray painted the chrome lids black and glued black heart labels on top (using spray painted woodshapes). 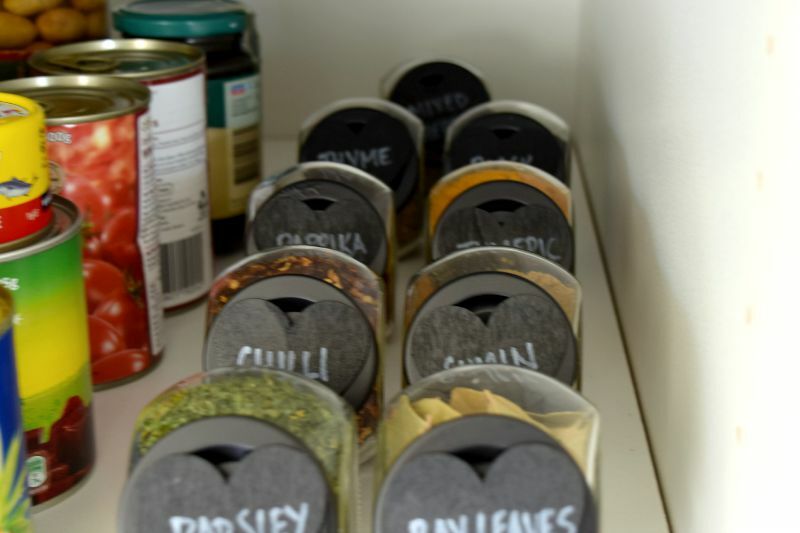 If space in your pantry is limited, you could place these on a spice rack or in a basket where you can stack them. 6. Finish by restocking your pantry — placing everyday foods where you can access them easily and items you need less regularly up high or down low. Our main shelves have been used for canned foods, spices, breakfast foods, and healthyish snacks, and those spray painted baskets with baking items and unhealthy snacks have been placed up high. Now the challenge is to keep my pantry this organised! 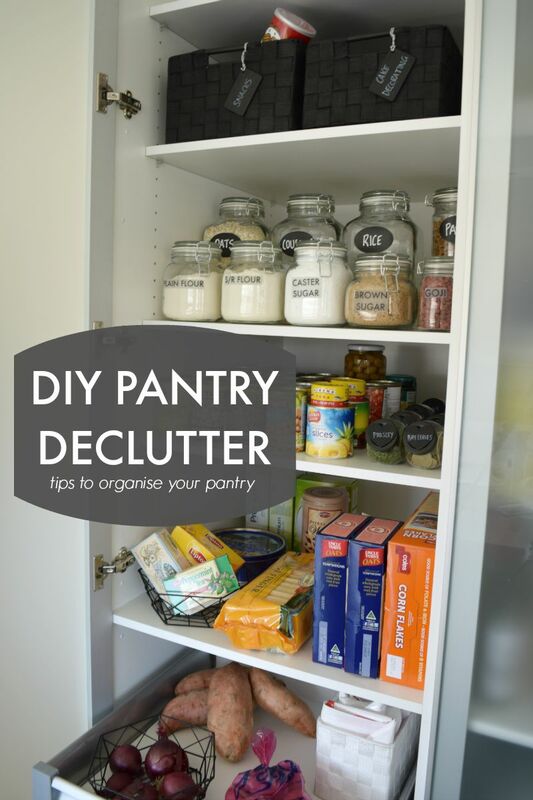 Does your pantry need a declutter? 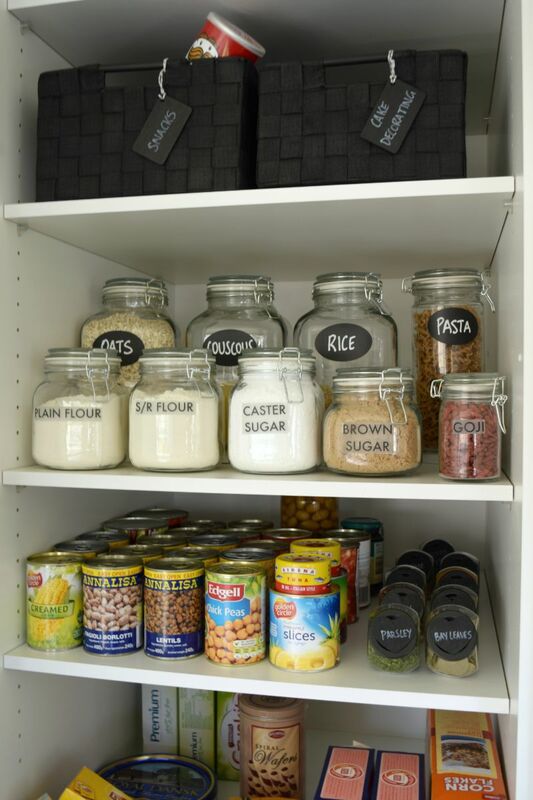 How do you keep your pantry organised? Tell us in the comments below! 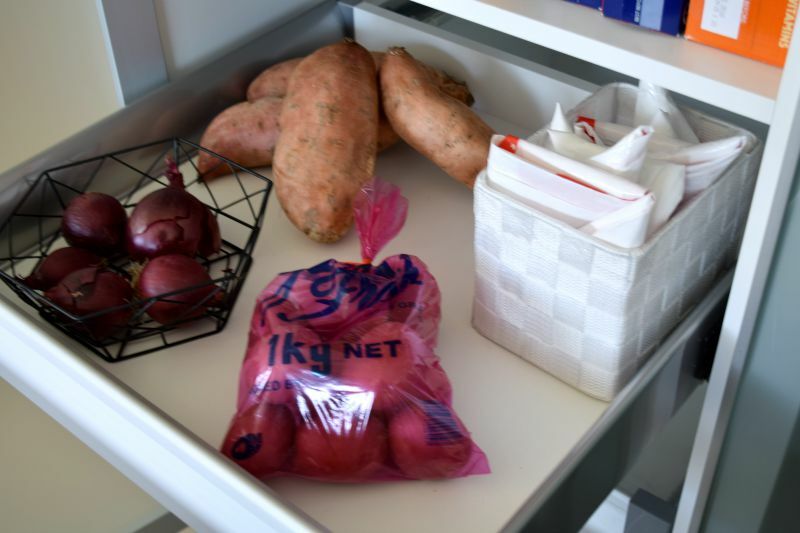 I love the pantry declutter, and the plastic bag demo. Going to do this today. He he, so glad you enjoyed it Stace! How exciting you’re a foodie blogger – your raw salted caramel slice looks amazing!!! Great tips and easy to follow steps! It looks lovely and neat ? Glad you found the tips useful Julia! Great article! Love the plastic bag tip! Thanks Dan, it’s such a pleasant change from before 😉 I especially love those clip top jars with chalkboard labels! Ohhhhh that looks so PRETTY!!! !